Credit where it’s due, it really does feel like HP did their homework with the new OMEN Reactor gaming mouse. They didn’t just stick a bunch of RGB lights and a reptilian name on a regular mouse and call it a day. The HP OMEN Reactor feels like an earnest and genuine attempt to offer something tailored for the gaming market. And, while HP’s relative inexperience in the area is made manifest in spots, there’s a lot here that I hope other gaming peripheral brands take the time to learn from. As far as gaming mice go, the HP OMEN Reactor is unique enough to stand out but, depending on your setup, it’s maybe not quite the slam dunk it needs to be to live up to the price tag. If you’re expecting something a little bland and generic, you might be surprised by the caliber of what’s on offer here. This ain’t no Lenovo Y Precision gaming mouse. The HP Reactor mouse honestly looks and feels like the kind of mouse you’d source from a brand like Corsair, Roccat or SteelSeries. It’s one of those mice with lots of hard, slanted angles and partially-deconstructed sides. The whole thing is made of plastic, which does detract from the feel of it. However, the metal cabling here more than makes up the difference. If anything, it’s the high-point of the Reactor’s design. I don’t know if I want to go so far as to say it’s tangle-proof but it’s certainly resistant to it. Before long, I wished more wired mice touted this feature. HP’s ongoing forays into the world of material design pays off here. It’s just a shame that the rest of the Reactor mouse feels so lackluster by comparison. There’s no textured rubber grips like that found on the HyperX Pulsefire FPS Pro or Razer DeathAdder and the thumb-rest isn’t as comfortable as you’d hope it would be. The height of the back half of the mouse is adjustable, which is a clever inclusion. Yet, I can’t help but wish HP took things further and included similar toggles and levers for other parts of the experience. If you’re going to go beyond the basics of what a gaming mouse should offer, go all the way. Truly let me make this mouse my own. 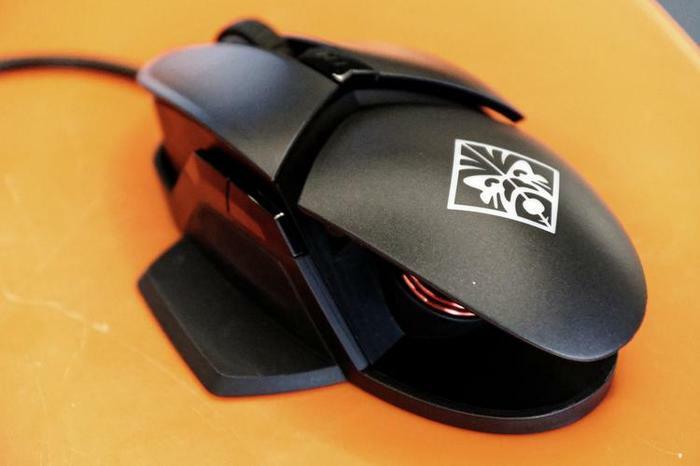 Despite lacking in a a few key creature comforts, the acceleration and accuracy of this mouse made playing fast-paced first person shooter titles like Overwatch a really enjoyable experience. The metal cable kept things from getting too tangled, the optical-switches are really clicky and and it’s difficult to complain too much about a response time of 0.2 ms.
That said, the Reactor does run afoul of a few common pitfalls. Between sessions, the RGB illumination is cool enough to look at but, unfortunately, it ends up being mostly obscured when you’re actually using the mouse. In addition, the Reactor often doesn’t really feel like it glides across your desk with the level of grace found in other, cheaper mice. It’d be maybe too harsh to say it gently scraped across my desktop - but, safe to say, the 160g weight does take its toll. Last but not least, the thumb rest on the Reactor isn’t as comfortable as it ought to be and I wish the macro-keys wedged on the side of Reactor provided better feedback when pressed. Don’t get me wrong, there’s a lot of individual things I really like about this mouse. But it’s hard to walk past all the other areas it feels like HP need to up their game if they want to seriously compete with heavyweights like Razer and Corsair. If you like the look of the HP Reactor, chances are you’ll like the reality even more. It’s a gaming mouse that takes a surprising amount of bets. And while not all of these bets pay off, they do serve to put HP in a really interesting position going forward. There’s stuff in this mouse that’s absolutely better than even what even the best and brightest of the gaming space are offering. There’s a lot that isn’t. But the fact that there is any sort of competitive edge here at all is testament to the quality of product that HP are capable of bringing, and have brought, to bear. Watch this space. And, if you hate tangled cords, maybe give this one the time of day it deserves.